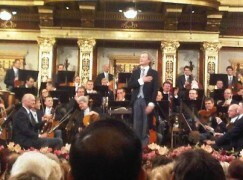 The Vienna Opera boss Dominique Meyer and Vienna Philharmonic chairman, Andreas Grossbauer, have given Der Standard an insight into their priorities. At the opera, the orchestra expects to be consulted on all future plans. They have a fruitful dialogue with the Frenchman Meyer and expect the government to renew his contract when it expires in 2017. Their relationship has grown closer since Franz Welser-Möst walked out as music director of the opera house. Meyer says he won’t be looking for another music director if he stays on for another term. ‘One can find good solutions, and we have done,’ he says. That begs the question: does any opera house still need one? It seems like a common sense solution: just one captain on the ship. From a historical perspective, Dominique Meyer’s choice doesn’t sound that new. The Vienna State Opera has been mostly led by one person, although the director had sometimes been a renowned conductor, such as Mahler, Krauss, Böhm, Karajan, Maazel. The first post-war dual leadership of director and music director at the Vienna State Opera started with Abbado/Drese in 1986. Not to be pedantic but, Karajan had a co-Director, Walter Erich Schaefer, when Karajan was Director of the State Opera. Karajan was director of the Vienna State Opera from 1956 to 1964, and was joined by Schaefer only in 1961-62. Schaefer was intendant of the Stuttgart Opera from 1949 to 1972, without technically stepping down during his Vienna year. Their decision simply validates FWM’s frustration with them and proves his point. They never considered the music director necessary even when they had one.